I’m totally obsessed, and I haven’t even gotten a chance to play with it in-stores yet! I just snagged a pamphlet on the way out a couple weeks ago, and did some research. I most definitely want one! I’m thinking of maybe seeing if I can get one before heading out to Maui… the way I read, it’ll be far easier (and lighter-weight) to take this along versus :does the math: the 4 or 5 actual books I’m sure I’ll read while there/traveling to and from. 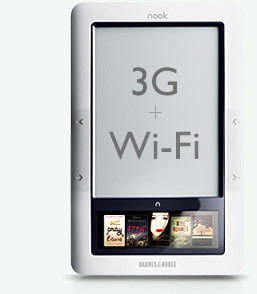 The Barnes&Noble Nook eBook Reader.